At long last, Android M finally arrives! The developer preview was recently launched at Google I/O 2015 in San Fran. The version, according to Sundar Pichai, the senior vice president of product at the tech giant, is going to revert to the very basics of the OS. Unlike the older Lollipop, Android M will not feature a new design or ardent aesthetic enhancements. Instead, it will focus more on improving the stability and functionality of the OS, overall. So, get ready for some long-lasting effects. Sans much excitement. Which phones are likely to get the update first? According to popular tech-junkie and blogger, Shu On Kwok, Google’s Nexus range tops the list, specifically, Nexus 4 and 10. The others, namely, Nexus 5, 6, 9 and Player, have already received a pre-release version of the OS. Other than that, HTC has already announced the big update coming on its HTC One models, M9 and M9 +. Samsung, as of now, is silent. But, rumours are, that Galaxy S6, S6 Edge, and Note 4 might get the update soon. Another firm that remains unspeaking is Sony, although Kwok believes that Xperia Z3, Z3+, Z4 and the tablet of the brand would receive the Android M update. Similar assumptions have been made for LG G3 and G4. Of the Motorola range, Moto X will probably be the first phone to get the update, although Moto G and Moto E have also been included in the checklist. Which features will define this new update? Presently, the scenario is like this: Users download apps and expose them to different features and information on their mobile device. This is a thing of security concern, because, knowingly or unknowingly, people are unlocking the sealed channels to alien developers to access personal data. However, app permissions have undergone a face-lift in Android M. Users will have a better control over the applications now. They will be able to decide which features such apps will be able to access. They will also be able to choose, accept or deny permissions according to their wish. “You don’t have to agree to permissions that don’t make sense to you,” says Dave Burke, the vice president of engineering at Google. He demonstrated the feature using the popular cross-platform mobile managing app, WhatsApp. Accordingly, if you wish to record a voice message using the app in a mobile device, which has Android M installed in it, you will be notified with a one-time request for permission of using your phone’s microphone. 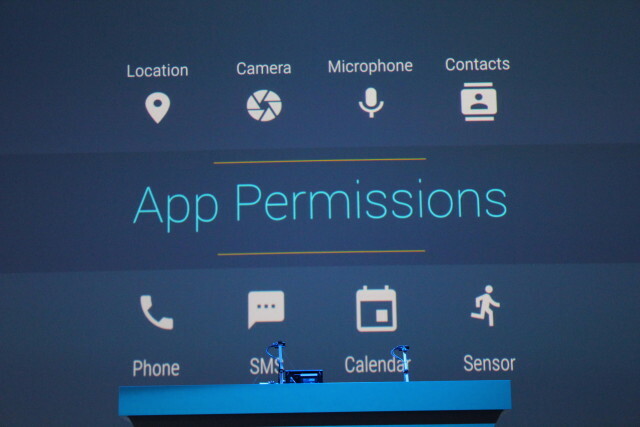 Similarly, one-time permissions will be asked for, whenever the app wants to access different features of the device. Deny them if you wish to, or accept and modify them at a later date using your Settings. You can also view permissions according to their types and check which applications have it. This version of the Operating System will have a feature called New App Links. This will allow developers to delete ‘disambig’ boxes that arise when certain apps try to link users on the web via multiple routes. Such apps will now be able to create their own, customised Chrome tabs rather than directing the launch of the Chrome app separately. Of course, the user’s Chrome data, including preferences, passwords and profile information and will be retained in their exactness. This feature will support automatic sign-ins, auto fill, password remembering, and multi-process security to integrate app and web experiences. With the new OS, it seems, faster and better navigation is soon to arrive. For instance, if someone sends you a link in Twitter, you will be able to view it via the Twitter app rather than having to open your browser every time. Likewise, the Pinterest custom tab will have a sharing button and dismiss the need of Pinterest developers to build a separate web browser for that. “Chrome Custom Tabs is a new feature that gives developers a way to harness all of Chrome’s capabilities, while still keeping control of the look and feel of the experience,” says Burke. This is going to be Google’s new mobile payment service and an answer to the rival app, Apple Pay. Android Pay has been designed in a way such that checkout processes become easier and quicker. Burke has revealed that this app will be available in over 700,000 stores across the States. It will work at any NFC-enabled payment gateway. 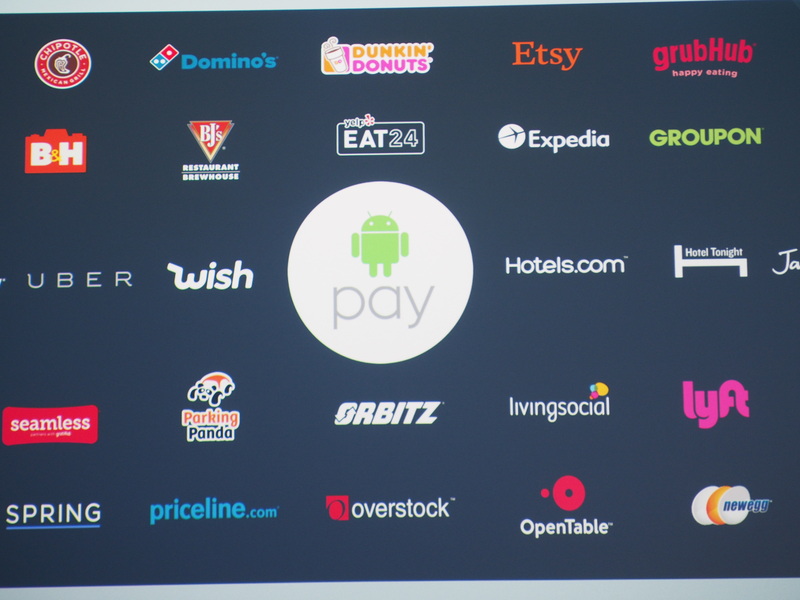 The good news is, Android Pay will function in Android devices that run on KitKat OS or above. Currently, the app is being supported by American Express, MasterCard, Visa and Discovery, although AT&T, T-Mobile and Verizon are also in the list. Its functionality is very simple and involves just the mere unlocking of the phone and waving it on payment terminals. Apple’s in for some tough competition. Google will introduce fingerprint-scanning support to apps running on Android M, particularly to Android Pay. But, the devices, like Samsung Galaxy S6 and Note 4, which already have such sensors, are subject to chance. Fingerprint support will allow the feature to run not only on locked phone screen, but also during in-store shopping, while making payments and even within Google Play Store apps. Doze is Android’s new power-saving feature. It will improve the standby time of the device with the help of its motion-sensing capabilities. This feature will understand if a device is being currently used or is lying idle. It will observe if the device is in someone’s hand or haven’t been interacted with. Accordingly, it will minimise the background processes and save battery that way. But, it will not turn off completely to keep activated alarms and incoming chat notifications. According to experiments carried out in Google’s lab, Burk claims that a device running on Android M will be twice as efficient in terms of standby, as another running on Lollipop. Moreover, this latest OS supports USB Type-C, which accounts for faster charging and allows users to charge other devices with their device, too. Micro USB will soon vanish, perhaps. Google Now has been improved for this OS version. Backed by Google Knowledge Graph, and a new feature called ‘Now on Tap,’ it will have a huge expertise of different things and provide accurate answers to your queries. Google Chrome is faster than before. It is now well versed with network strength displays it accordingly. For instance, if your data connection is slow, you’ll see coloured squares in preview images rather than the actual image itself. In addition, web pages that have been optimised, will use 80% lesser bytes and load four times faster. This improvised Chrome will also back offline mode. Google Photos, earlier a part of Google+, is the new service introduced in Android M. It is now a standalone service, which will enable an unlimited storage space for high quality 16 MP images and 1080p videos – an impressive addition. Other than that, there’s improved text selection and floating toolbar, a revamped volume control, quick DND settings, direct data sharing facilities, an adoptable storage devices feature, auto backup of applications, support for Hotspot 2.0 and 4K display resolution, improved calculator, and some subtle changes in UI. Phew! When is the update going to hit the market? The final version is set to launch somewhere in Q3 of this year. Fingers crossed till then. So, should we call this Google dessert OS this time? Marshmallow? Milkshake? Muffin? Malteser? Macaroon? Suggestions are invited!